Our vet called today to say that some test results came back and, in addition to having kennel cough, heart worms, fleas, and intestinal parasites, George also has whip worm! Luckily, he just needed a three-day medicine that’s super easy to give. And actually, George takes all of his medicines like a champ. I just mix the pills up with a little bit of soft dog food and he houses them. 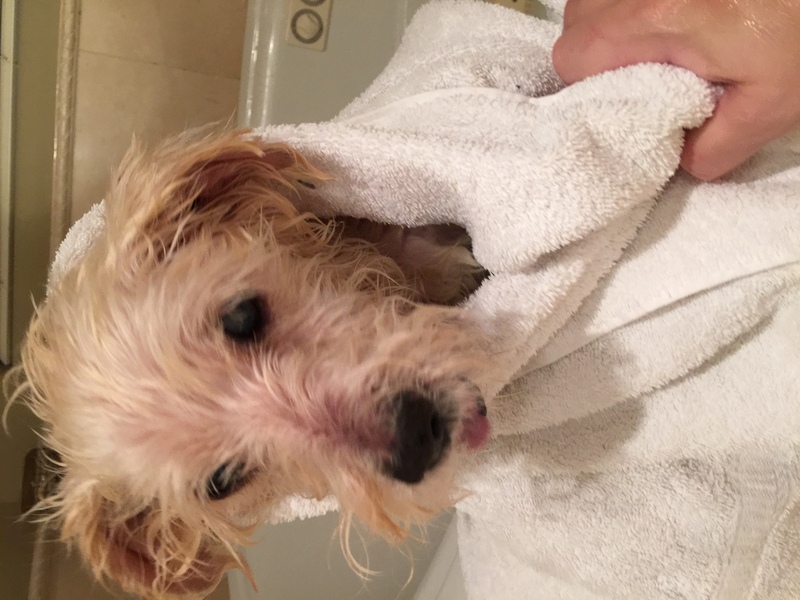 After I fed George, gave him his meds, and walked him a little bit, it was time for him to get a bath. The fleas are gone, thanks to his flea medicine, and the feces and urine that were matted into his hair have been shaved out, so it was time to get him cleaned up. This was George on Day Two, after I’d cut the hair from his eyes. His eyes are full of crusty whatever, and he’s got flea poop all over his snout. He smelled just awful. I’m not going to tell you that George was happy to get a bath. It was an experience that he definitely was not used to getting. I filled the bathtub with water and put him in the tub, hoping to pre-soak some of the nastiness off George. George in the bathtub. You can see all the flea poop on his poor little face. I lathered him up and gently scrubbed him. I cleaned off all the flea poop, and picked off all the crusts from his eyes. I cleaned the flea poop out of his ears, and scrubbed his little rear end. I drained the water, rinsed off George, refilled the water, and did it all again. Once he was clean, I massaged in some conditioner. I don’t know if you can tell by looking at him wet, but when he’s dry George looks way bigger than he is! 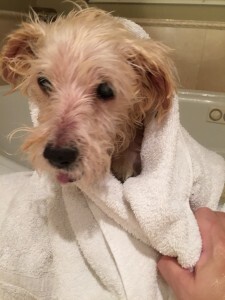 His poor little body has been eaten up by all kinds of fleas and worms, so he’s frail, thin, and hungry. He was really happy to be done with the bath. I dried him off, then I cleaned the bathroom where I’ve been keeping him quarantined. I put down fresh, clean blankets for this little fresh, clean fellow. And here we have Clean George! His fur is super soft and now he smells fresh. I took him outside to potty and his tail didn’t stop wagging. He still has the terrible cough, but with the meds that he’s on, he’s able to rest and only wakes up to cough every few hours. A few more days, a few more steps and George is going to be super cute and irresistible! Stay tuned. I got George late Thursday night and made a bed for him in the bathroom of our bedroom. I knew that he had kennel cough and fleas, and probably other things, and I needed to keep him away from my dogs until he’s better. At the same time, I wanted to be close to him in case something happened. 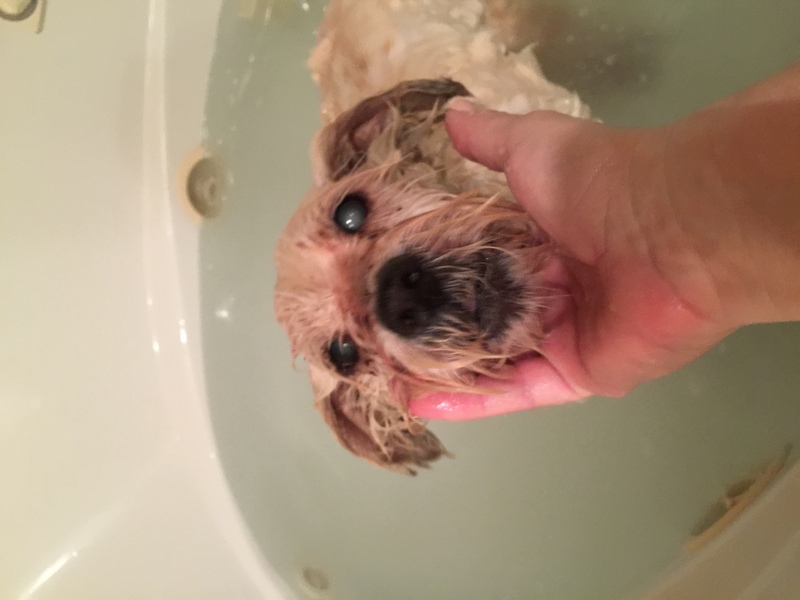 It turns out that the master bathroom was a bad idea for a blind, deaf dog. It was just too big and he spent a lot of time pacing and trying to feel out the space. It was just too big for him. Eventually, though, he got either comfortable or tired, I’m not sure which. But he got into his little bed. Unfortunately, he was up and down for most of the night because of his terrible cough. He coughed long and hard, and he coughed up blood. On Friday morning, I took George outside to do his business and noted that he has worms too, poor little guy. I couldn’t wait for our veterinarian to come and take a look at George. In the meantime, I fed George and decided to tackle his matted hair. I’m not a groomer, and I don’t have buzz clippers. I put on medical gloves and took George outside. I spread newspapers out on the driveway and pet George to let him know that it was going to be ok. I decided that I needed to cut the hair away from his first, so I could see what’s going on there. So what’s going on there? Well the first thing you can see is that his snout is covered in what looks like dirt. It’s not dirt, it’s flea poo. It’s really tragic when a dog has suffered with fleas for so long that he’s given up even trying to scratch them off. They just dig in and feast on the dog, and leave their mess everywhere. There’s not much I can do about that until the vet gets those fleas off him for me, so that’s for tomorrow. The second thing you’ll notice is that George has a cataract in his left eye. I didn’t see one in the right eye, but there’s so much crust and nastiness in his eyes, it’s hard to tell. I cut all that hair out of his eyes. Then I turned him around and began to get some of the matted hair off him. His ears were matted with flea poop, so I cut as much as I could there. I watched the fleas crawling all over him and tried not to scream. 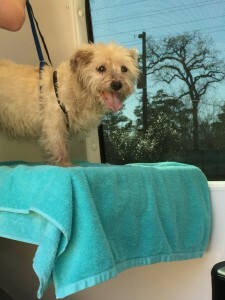 His bum was matted with urine and feces. He’s definitely been sitting in his own mess for a while. I cut as much off as I could with scissors, and by then George was really trying to pull away. 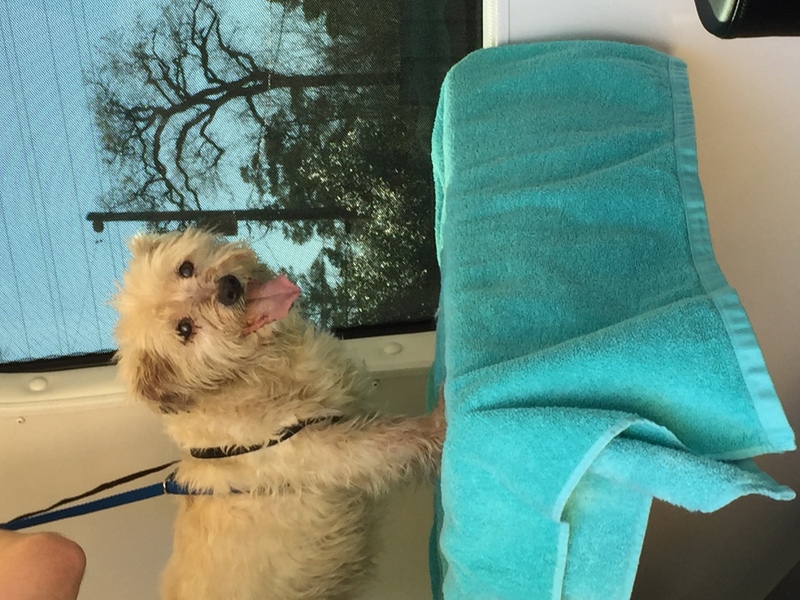 I didn’t want to hurt him or to stress him out, so I put him in a kennel until our vet came. I gave him another small meal –I’d decided to feed him small meals because, without knowing what’s going on with him, I didn’t know how his little tummy would react. 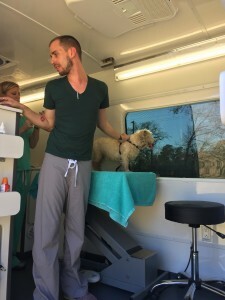 Dr. Eich and Bobby pulled into the driveway just an hour later (yay for mobile veterinarians! ), and Dr. Eich got to work. She took blood, a stool sample, and gave George all of his shots while Bobby multitasked, comforting George, distracting him with cheese, and taking notes. 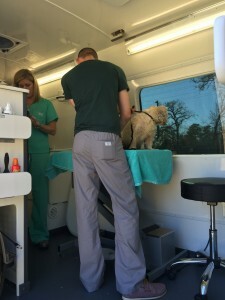 Dr. Eich buzzed the remaining matted poop from George’s matted behind, and clipped his long, overgrown nails. 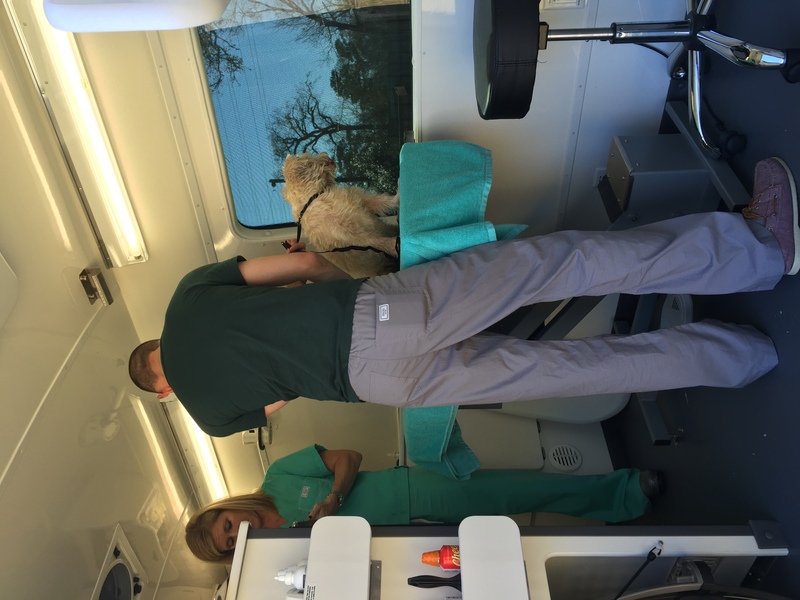 Dr. Eich, Bobby, and George in the mobile vet van. Dr. Eich estimates that George is between 10 and 16 years old. He’s microchipped, which makes the fact that his owners dumped him even sadder. He’s neutered as well. 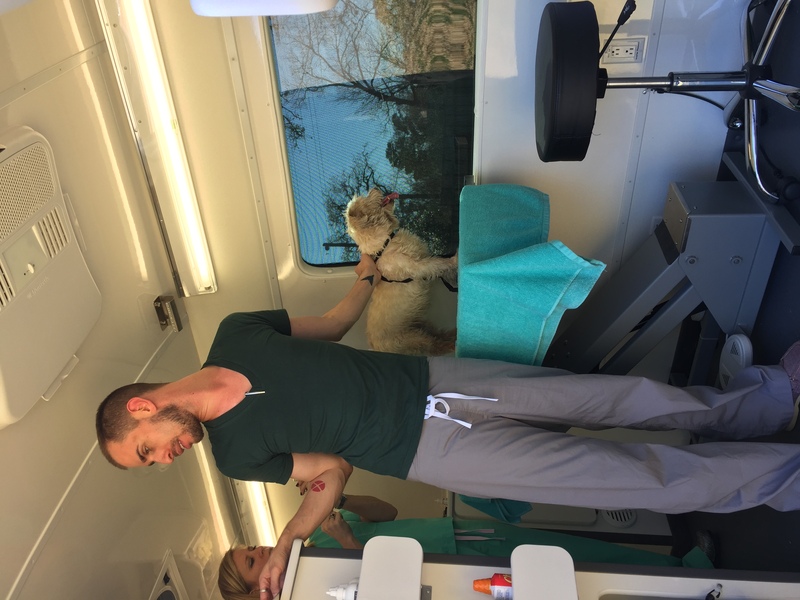 After Dr. Eich looked at George’s blood, we learned that he has heart worms. Additionally, he’s got worms in his stool, kennel cough, fleas. She started him on meds to get rid of the kennel cough, start on the heart worms, and get rid of the fleas. She gave him a dewormer for his intestinal worms. After all that, George is starting to come around! Look at that little face! George, after his vet visit, looking improved! I made up George’s bed in our powder room instead of the bigger bathroom, and blocked the doorway off so my dogs can’t get near him (because he’s sick). As I walked George back into the house, I got my first reward – a tail wag! This is the first time that George has wagged his tail! I know he’s feeling at least a little bit better. At the same time, I know he’s tired, so I didn’t want to push him by giving him a bath or cutting any more hair. Tomorrow’s another day. When people see my dogs, they often tell me how cute, sweet, and playful they are. They are cute and sweet now, but when I got them, they weren’t so cute and not quite so sweet or playful either. Dogs are what we make of them. 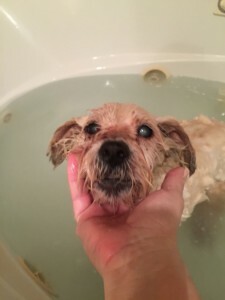 So I wanted to share what I think will be a pretty significant transformation and share how we get from a dog in terrible condition that no one wants, to a cute, sweet pup. This is all about George. 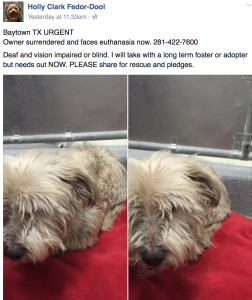 George was released by his owners to the Baytown Animal Shelter. If you’re not familiar with this shelter, it’s been in the news quite a bit recently for its inhumane treatment of animals. But that didn’t seem to bother George’s owners. George is a bit older, deaf, and blind and apparently they decided that it was time to dump him. I saw a post of George on Facebook. Lou Sisk, a rescuer in Baytown, posted George’s picture. Holly Dool reposted it. 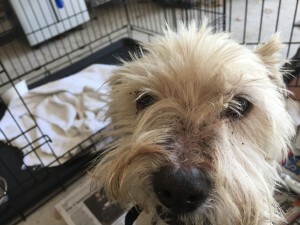 I contacted Holly this morning and offered to get George to the vet and to foster him for a week or two if Holly could find a long-term solution. 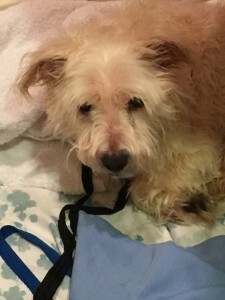 Holly connected with the Blind Dog Rescue Alliance, and they agreed to take George if I could foster him for a week. Yes!! Another rescuer volunteered to physically pull George from shelter hell, and to meet me with him. Tonight, we met around 7:30 p.m., transferred George to my car, and I brought him home about an hour ago. I was told that George is around 10 years old. I’m not so sure of that, but I am guessing from the look of him that he has tape worms, kennel cough, and fleas. His hair is horribly matted, particularly around his rear end. He’s probably been sitting in his own feces and urine for a long time because he smells incredibly awful. But this is just the beginning. Let’s see what we can do with little George in a week. He’s going to be a different dog, I promise you that. Stay tuned. This recipe, and in fact, this blog post is not for you. While I hope that you enjoy it and try the recipe, it’s not written for you. It’s not written in any kind of effort to start a food blog, or to be a foodie, or to show off any kind of cooking skills. The post is written for Denise. In December, Denise, one of my dearest bestest friends, came to Houston. Denise’s brother has cancer and was getting some treatments at M.D. Anderson. Denise was here to be with him for support. While Denise and I were visiting, she told me that her brother’s Oncologist advised him to avoid processed foods, and more importantly to avoid the sugars that are added to most processed foods. Denise wants to cook more, to avoid the processed foods, to avoid the added sugars. I cook. A lot. So I’m going to try to share some recipes and cooking methods with Denise. We live 3 hours away from each other, so I can’t show her in person. I’m going to try to show her via blog posts, because I love her and I want to support what she’s trying to do. This is the first post, and I hope there will be others. I’ll try not to be too Italian-snobby about things. I said that I’ll try. I’m not suggesting that I’m a know-it-all, or that I have the best methods of cooking. I’ve never been formally trained to cook. I’m not perfect and I don’t provide perfect recipes. I learned to cook by watching my mom, my grandmothers, my great grandmother, my aunt, and my great aunts. They were some amazing cooks and if I ended up with just an ounce of their cooking ability, I’d be happy. I’m telling you all of this, but I don’t want to hear or to read any comments that aren’t productive. If you’ve got a better recipe, share it. If you’ve got a pointer, give it. If you know something I don’t, tell me. Just don’t be a jerk about it, ok? 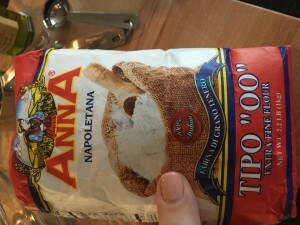 This is a recipe that can be used for making both bread and pizza. I usually make the dough, then divide it half and make two pizzas and a loaf of bread. Denise, try it out for yourself, but I think for two women and two kids, two of these pizzas (with a salad) would be enough for dinner, and you’d have some pizza to have for lunch the next day too. You need a pan or tray or pizza stone for the pizza, and a board or counter top to use to knead the dough. 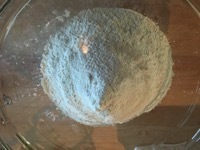 Sift the flour into the bowl. You have to do this, you can’t just dump the flour in the bowl. Sifting makes the flour lighter and we want that for this dough. Add the yeast, sugar, and salt. Add the oil and the water. I would just put my hands in that and start mixing it up, but I get that this might be weird for some people, so get a wooden spoon and slowly start to mix this all together. When you get to this point where the dough looks like this, you are going to put the dough on the wood board and start working it with your hands. 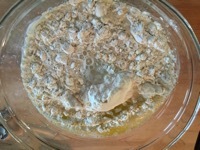 See how the dough is together, the moisture is absorbed, but it doesn’t really look like bread dough yet? Take some flour and spread it in the center of the wooden board. How much flour? I would put down maybe three tablespoons. You are going to knead the dough and you really don’t want it to stick to the board. See what the dough looks like there at the end? That’s when you’re done, when it looks like that. 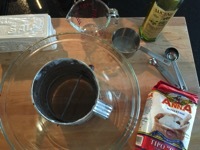 Grab that bowl, the same one you mixed the dough in, and throw some flour in it, coating the bottom and the sides. 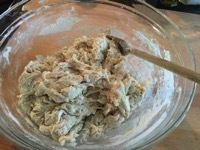 Then put the dough back in the bowl and cover the top with plastic wrap. Make sure the plastic isn’t touching the dough. Take a picture, so you can remember the size of the dough, then cover the plastic with a kitchen towel and leave the dough to rise. It needs to at least double in size and having the picture before it starts to rise will help you figure out if it’s doubled. This is kind of common sense, but if it’s warm, it’s going to take less time to double than it will when it’s cold. In this particular case, it took about 2 1/2 hours to double because it was cold. This won’t take you two hours, but while the dough is doing it’s thing, you can get the pizza toppings ready. I made one pizza with light tomato sauce, fresh mozzarella cheese, and basil. I made the other pizza with just olive oil, cheese, mushroom, and a little bit of truffle oil. But you know what? You can put whatever you want on it, it’s your pizza. Just try to avoid really processed toppings —that defeats the purpose of doing all of this! For the traditional pizza margherita, start with some plain tomato sauce. Pick up a can or bottle of either the organic plain sauce or a good Italian brand, but make sure that it’s plain and not seasoned. You’ll use a some for the pizza and put the rest in the fridge because we are going to use it for other recipes, TBD. If you use a can, make sure that you put the left over sauce into a sealed container. Don’t put it in the fridge in the can. I like light sauce so I used about three tablespoons of sauce. If you like more, double it or triple it. I added about a tablespoon of olive oil. I don’t measure what I do, so I’m eyeballing it. I’ll try to get better about measuring! Now, season this by adding some salt and pepper, then mix it up. Set it aside. For both pizzas, I use fresh mozzarella. Denise, you can get this at Central Market. You don’t have to buy the mozzarella made in Italy, but that’s what I buy. The mozzarella comes in a salted water, so you’ll take the balls out of the water and slice them. For the mushroom pizza, I used organic canned mushrooms. Under no circumstances should you put fresh mushrooms on a pizza. That’s a moronic thing that Americans do. If you only have fresh mushrooms, slice them and sauté them before you put them on a pizza, please. Please! Preheat the oven to the highest possible temperature. My oven goes to 500 degrees so that’s what I used. I cut it in half, right there in the bowl with a knife. Then cut that half in two. Put some flour on your board again and now we will make pizza! Ok, you have your 1/4 of the dough in front of you. Here’s our goal: stretch the dough in a thin, evenly leveled pizza. To do that we are going to: Stretch and Turn. That’s it. Put the dough down on the floured board and poke it down with your fingers so it’s a circle shape. Mentally divide the circle into quarters, like a clock. Turn the dough one quarter and stretch it again. Turn a quarter and stretch it again. If you feel comfortable, pick the dough up and gently throw it from hand to hand, to help it stretch faster. If you don’t feel comfortable, don’t worry about it, just keep stretching it on the board. Here’s my pizza, stretched out. Drizzle some olive oil on the pizza and spread it out. It’s not perfect, far from it. But it’s fine! Drop your sauce in the middle and use a spoon to gently spread it outward. Sprinkle the basil all over, but don’t put the cheese on yet. Put the pizza in the oven for about 10 minutes. (Set the timer!) After ten minutes, grab your cheese slices and head over to the oven. Using a mitt, open the oven and pull out the pizza. I do this right at the oven. Add the mozzarella. Put it back in for another 10-15 minutes, depending on how dark you like your pizza. I like mine light, so I took it out after 10 minutes. While this pizza is in the oven, you can start the mushroom pizza. I like to make it a rectangle shape, but you can make it the same circular shape as the first pizza, it doesn’t matter. Add the olive oil. Put this in the oven for 10 minutes, then pull it out and add mushrooms and cheese. If you like truffle oil, then you can drizzle a little bit sparingly, a little goes a very long way here. Make a nice salad and dinner is ready. I like an arugula salad at this time of the year since lettuce isn’t in season. With the 1/2 batch of dough that you have left, you can make a nice loaf of bread. If you have a bread pan, just put the dough in the bread pan, cover it up with plastic and a towel, set it on the counter, and let it double again. If you don’t have a bread pan, form an oblong loaf and put it on a sheet pan. Cover it up, set it on the counter, and let it double. Once the dough is doubled, preheat the oven to 450 degrees. Take a knife and make gentle cuts in the top of the loaf at an angle. Then bake the bread until the top of the bread is brown. This is the lightest it should be, don’t take it out any lighter than this. Let’s say that you want to eat some nice hot bread and butter for breakfast. So instead of letting the dough rise on the counter, put it in the fridge. It will slowly rise overnight, and you can bake it in the morning. Hot, fresh, homemade bread. Yum! My cousin Roxsan died ten years ago today. 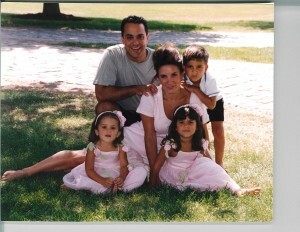 It doesn’t feel like ten years have passed, in fact it doesn’t feel like a day has passed. When I close my eyes, I see Roxsan just as she was before she got sick –young, beautiful, and with a full life ahead of her. I close my eyes again and I can see her when we were children, playing together on Sunday, the day that our family gathered for a big meal after church. When I open my eyes, I wonder, what would she look like now? What would we talk about when we would see each other over the holidays? 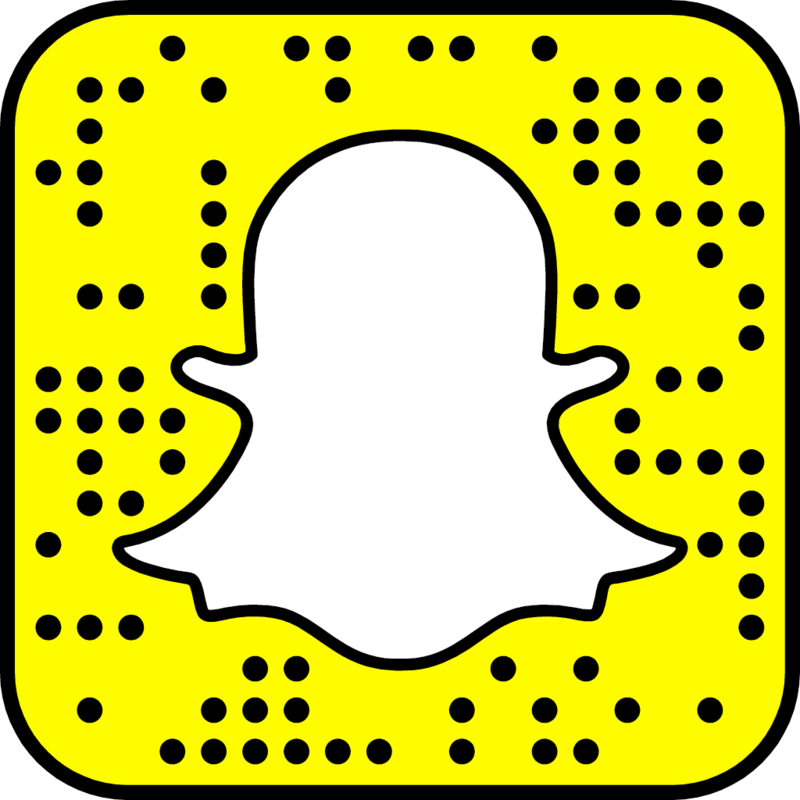 Would we be keeping in touch on Facebook or Instagram? I close my eyes again and try to imagine, but I can only see the two of us as children, riding the kiddie rides at an amusement park, Roxsan forever young. Andrea Bocelli performed last week at the Toyota Center in Houston and we were front and center. I was delighted that he performed mainly opera favorites! We had great seats, center, row 6. I’m a terrible photographer, and even worse videographer, but you can close your eyes and just listen to something beautiful. Here we have Libiamo ne’ lieti calici, the famous brindisi duet from La Traviata. The second video is, of course Nessun Dorma from Turandot. By the time he sang this song, my sister had moved to sit in the row in front of me, so this is mainly a video of her hair! But it sounds lovely. I think that someone got a few more videos so I’ll update this post when I find them!